Videoconferencing used to be a luxury; and a logistical nightmare of coordinating schedules at special videoconference centers and hoping the connections held up. As technology advanced, the idea of attending a deposition remotely became more and more realistic. We once had an attorney comment after completing a videoconference that he felt like he was watching Max Headroom from the famous 1980’s Coke commercials. As standard internet speeds rose, so too did the availability and quality of videoconference sites as more companies were able to support the bandwidth requirements; and better nationwide infrastructure made drop outs the exception instead of the rule. At a glance, a Skype connection will always beat out a professionally hosted videoconference as anyone can sign up and use a Skype connection for free. However, that is just the tip of the iceberg so to speak. It goes without saying that in order to have a successful Skype deposition both/all parties must have a computer/laptop/tablet in order to participate and just one person not having access to the right equipment means the deposition can’t go forward. Other factors that should be considered are things like conference space and the printing and managing of exhibits. Videoconferencing rates have been reduced significantly over the last several years. That, combined with the fact that 99% of videoconferences are now conducted via IP versus ISDN, the rates can be half of what they were years ago. The other major consideration is the hidden cost of going the cheapest route. We have seen many instances where the video portion did not work and the deposition needed to be rescheduled. When you consider the cost per hour of an expert witness these days, you definitely want a professionally managed remote videoconference. When you schedule a professionally hosted video conference you know that all sites are experienced and equipped to handle the conference. Videoconference sites consistently run tests with each other to ensure nothing is wrong with their equipment or the connection in between. Using a video chatting service offers none of this reliability. With Skype, Google Chat/Hangouts or any other similar services, you are tied to whatever kind of internet connection you can get. And in most cases, that means a home or hotel wireless connection on at least one side, which anyone can tell you is not always the most reliable. It is also very important to note that the reason the deposition is being conducted is to create a record of what the witness has to say in the case. A videoconference connection provides for a much higher quality connections which leads to better video and audio. This will help the court reporter and attorneys create a much better record of the deposition proceedings. 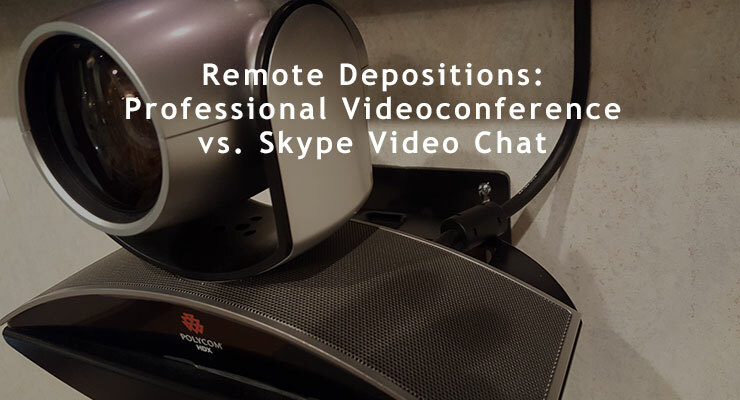 Video chat like Google or Skype (assuming everything works) is the most convenient way of handling a remote deposition. No matter how comfortable and close a videoconferencing location is they just can’t beat simply opening a program or app and connecting. Videoconferencing does have the edge in arranging all needed connections and bridges before the deposition starts, as a multiple site call can have some complications when figuring out who should call who and coordinating who will host the call etc. However, this leads to a relatively new development some court reporting firms are now offering. At Mike Mobley Reporting, we have always suggested using traditional videoconferencing for depositions. The encryption level at which audio and video is transferred is equal to government requirements for security. Most people will remember the George Zimmerman trial and the nightmare Skype created when multiple outside parties hacked in the Skype call and joined the trial proceedings. With new advances in both wireless stability and software compatibility, it is now possible to have the best of both worlds. For example, here at Mike Mobley Reporting, we can set up a conference between nearly every type of device. For basic two location depositions, we have the standard video conference setup, but what happens if there are three locations? Or four? Or maybe a co-counsel wants to attend on their phone while traveling? We can handle all that. With the proper kind of bridging service people can simply click a link and join into the conference regardless of where they are and what kind of device they are using. With a little setup, it is also possible for participants to share screens of their computers or tablets allowing easy viewing of traditional exhibits but also videos or other kinds of multimedia. This kind of technology has been available in the past, but traditionally needed advanced warning to setup everything specific to that job; however newer software allows this kind of service to be set up essentially “on the fly” with no complicated setup needed at all. We recently conducted a deposition where attorneys from five different cities attended via videoconference and the witness was able to share his file via the conference. The attorneys were all able to view the file and mark portions of the file as exhibits online. The court reporter was then able to receive the exhibits electronically and distribute them to all parties. How has videoconferencing worked for you? What kind of problems have you had in the past? We would love to hear what kind of services you want for your remote depositions! Give us a call at (937) 222-2259 or (800) 894-4327 to discuss your needs or arrange a demonstration of our bridging services! Have law offices in Dayton, Cincinnati and/or Columbus, OH? Contact us to find out how we can facilitate meetings between locations. Steve Troncone has worked in the court reporting field for 11 years in multiple areas including videography, production, technology support and trial presentations. He has been working with Mike Mobley Reporting as a legal videographer and office support team member since May 2016.